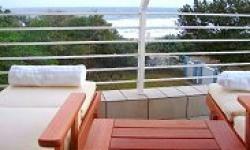 Welcome to 13 Indigo Bay, a Margate Holiday Apartment in KwaZulu-Natal on the south coast of South Africa. This is a privately owned luxurious beach front apartment. Indigo Bay is a brand new, modern complex situated on Margate beach. Breathtaking 180 degree sea view of Margate's blue flag beach in KwaZulu-Natal. This stunning apartment at 13 Indigo Bay has been equipped to the highest possible standards. Every convenience has been catered for to ensure the perfect holiday! This is a four bedroom flat, with a king, queen and four single comfortable, serta pillowtop beds for a perfect nights sleep. All bed linen is provided. There are two bathrooms (one en-suite), each has a shower, bath, washbasin and toilet. Bath towels are provided. 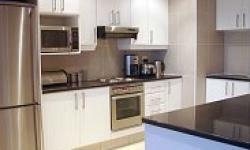 The modern kitchen is equipped with a stove (plates and oven), microwave-oven, cutlery and cooking ware, kettle, coffee maker, toaster, fridge and freezer, dish-washer, washing machine, tumble dryer, iron and ironing-board. The Lounge and Dining room include a dining-table with eight suede chairs, a reclining six seater leather lounge suite, 80cm Flat panel TV, DTSV and DVD player. A DSTV card is included with access to all available channels. The Lounge is fully air conditioned. The Master Bedroom is luxuriously appointed with built in cupboards and a blackwood dresser. Also has a 74cm flat panel TV with DTSV and DVD player. The bedroom is also fully air conditioned. All other rooms have b.i.c's, dresser units & ceiling fans. The large balcony has a large gas braai (barbeque). Comfortable seating for 8 people, and two sun loungers. Four deck chairs are also provided.